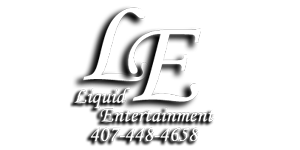 If you hire Liquid Entertainment as your DJ, then Jay Edwards will be your DJ. Your wedding will not be sub-contracted to another DJ or to another company. Your hire Jay, you get Jay, that's me. At how many weddings have you performed your services? I have DJ'd over 1200 weddings in the past 22 years in Central Florida and have worked at just about every hotel, country club, and civic center around town. Yes, in addition to being your DJ, I also take care of all of your announcements and emceeing. Once you arrive at the venue, you get to enjoy your wedding and I make sure your night goes exactly as planned. It takes me approximately 45 minutes to be completely set up and ready to go. However, I typically arrive an hour and a half before the start of the event to allow myself plenty of time, and you will see that noted on the contract. What is your attire you will be wearing during your DJ service? I typically wear a tuxedo, unless you would prefer me in a suit. It is your choice, tux, suit,or all black. I currently have over 60,000 songs in my music library. And all of my music is radio edit, which means you don't have to worry about any cursing in the songs. I have every decade of music, plus all the latest hits, salsa, merengue, reggaeton, bachata, and more! All of my music is digital and on a MAC computer. So, it is crystal clear and you don't have to worry about any interference or skipping. Yes, your dinner music is typically included in your 4 hour reception. If you need cocktail hour music, I can provide that for you as well. And I can also provide the equipment and music for your ceremony as well. Do you provide a wireless microphone for speeches? Yes, your Best Man, Maid of Honor, and anyone else doing speeches will be provided with a wireless handheld microphone for toasts. Yes, I have 3 complete sound systems that travel with me to every single wedding. That way, if something were to go down, your wedding doesn't miss a beat. Can we choose from a song list? Yes, you have complete and total control over the music at your wedding. I provide you with a music list for you to go through and circle what you like and cross off what you don't like. This way you create me a playlist, but you also create me a do not playlist. If there is a song on your do not playlist, it doesn't matter who requests it, it will not be played, no exceptions. Will you need a tablecloth or linens for the DJ table? Yes, typically your caterer or venue will provide a 6' table with matching lines. If they are not able to, I can provide my own at no additional cost to you. Yes, a signed contract and deposit are required to secure your date. The deposit is typically 50% of your total. However, if you need to arrange a payment plan for the deposit, I am happy to do so. The deposit is due when the contract is signed. Once the contract and deposit are received, then your date is secure. The final payment isn't due until the day of your wedding. You can simply give it to your coordinator, best man, maid of honor, or parents. Will you be available to eat a meal while DJing? I do not require a meal at your wedding reception. I don't take any breaks during your wedding reception. Absolutely! You will be provided with a written contract, guaranteeing that I will be the DJ on your wedding day. "The Knot Best of Weddings 2011"